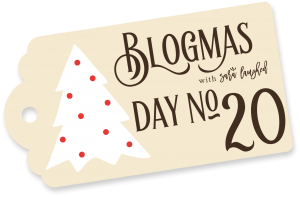 Welcome to the twentieth day of Blogmas with Sara Laughed, where I’m blogging every day ’til Christmas Day. Head over to my Blogmas calendar to see the full collection, or click on the gift tag below! I have a weird relationship with makeup. Sometimes I love playing with makeup looks, and wear some kind of makeup every day for months. And sometimes, I go without for a while, wearing no makeup at all. Lately, my makeup use has been closer to the former, and I realized that I wasn’t enjoying makeup anymore. I was wearing it every day, but it felt less like a means of self-expression than a requirement, so I thought I’d shake things up. 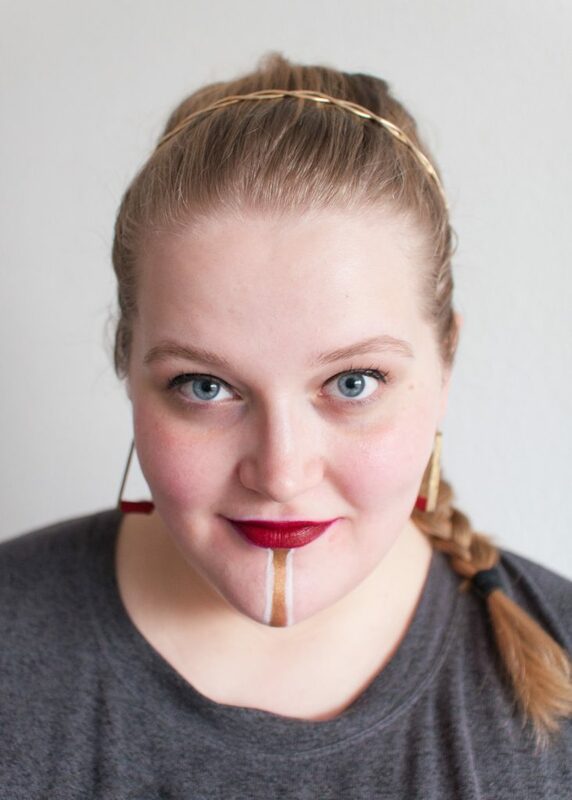 My first thought was that the thing that was missing from my makeup routine was creativity, so I turned to Pinterest and searched for unique makeup looks. I didn’t find anything interesting at first, until I stumbled across an avant-garde makeup look that used eyeliner to draw designs on the model’s face. I was intrigued. One search led to another, and soon I was knee-deep in the world of avant-garde and futuristic makeup. It was beautiful and edgy, and displayed a kind of confidence that I don’t often feel I demonstrate. 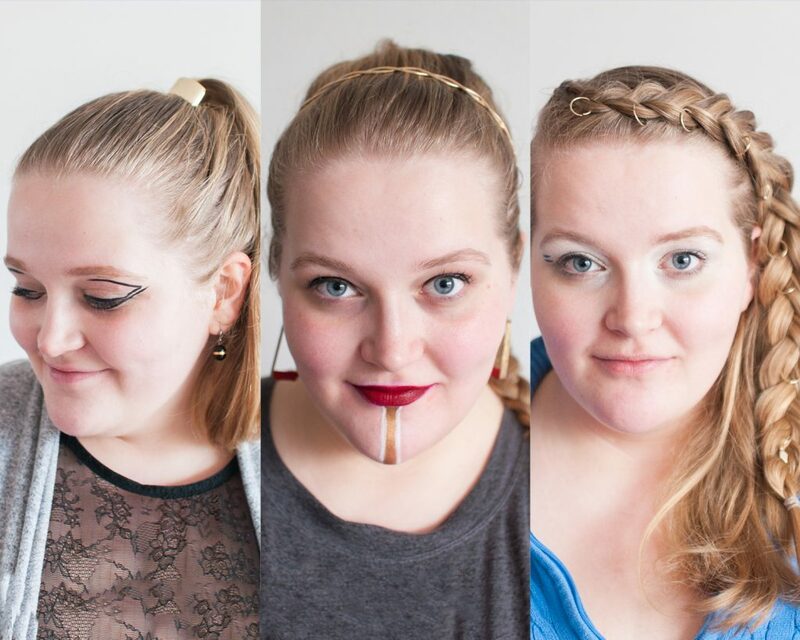 So I decided to challenge myself to five days of futuristic hair and makeup, to see if I could get out of my makeup rut. For this challenge, I decided to make a few guidelines. Wear futuristic or avant-garde makeup for five days in a row. The makeup has to be a look that I haven’t seen on other people in public, or that pushes the envelope in some way. The hair can either be used as an accessory to heighten the look, or just be left normal. Don’t tell anyone about this challenge, other than Ken (my photographer for this post). That means not my friends, my boss, or my boyfriend’s parents (with whom I was having dinner that week). I started that day, creating an eye look based on what I had seen on Pinterest: a kind of reverse cat-eye. For my hair, I just slicked it back in a high pony tail and added a gold ring around the elastic to cover it. I was really surprised at the positive response I got on this look. Ken and I went to Starbucks that afternoon, and the barista gave me a compliment and said that he wished he could wear makeup like that. I did get a few strange looks, but I actually felt very confident in this look. I had always assumed that people who were bold chose to wear bold things, but for me, it worked in reverse. Somehow, just the act of wearing something a little bold in public, even if I felt shy at first, made me feel bolder. 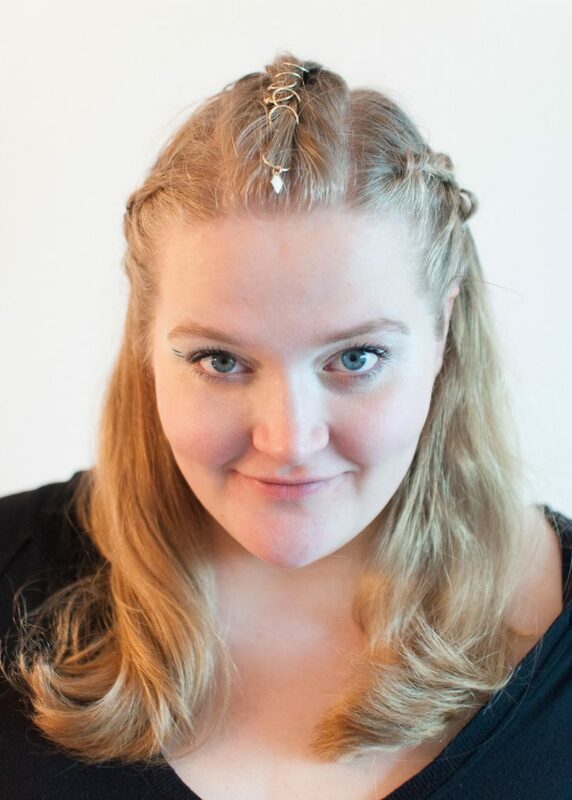 For my second look, I bought a few metal rings to braid into my hair. I put a plain white shadow on my eye and drew on two accent lines in blue eyeliner. I wore this look to dinner at Ken’s parents house, which I was fairly nervous about. To my surprise, I didn’t get any comments or strange looks, either on the walk over to dinner or from Ken’s parents themselves. This look ended up being my favorite from the week — even though it’s still fairly bold, I think it’s the most wearable of the ones I tried. I actually really love the gold rings in the puffy braid, and I think I’d wear it again for a normal look outside of this experiment. On the third day of my experiment, I did something similar to the previous look, but with an edgier hairstyle that brought the rings closer together. I left the eye makeup the same. I worked from home that day, so there wasn’t too much to report on in terms of responses, except when I had to do a Skype call with one of the clients I freelance for. We usually Skype without the video on, but this time I accidentally clicked the video icon and briefly appeared on the screen before disappearing again. It would have been fine either way — the look isn’t so out there that it’s not professional enough to work at home (though I don’t think I’d wear this to a typical office). Still, in that second I panicked just a little! On Day 4, I was planning on going out into Utrecht to watch Ken speak at a meet up. The talk he was doing was pretty creative; he’s a coder and his talk was on raymarching, which is essentially a method of creating 3D psychedelic displays using coding. Since it was a little more out there, and since the talk was at a meet up and not a conference (by this I mean, everyone would be in jeans and tee-shirts and not nice clothes), I wanted to try something that felt kind of edgy too. I decided for a cat eye and an ombre lip effect. I really liked how this look turned out, but my mom told me that it looked like I had herpes (thanks, Mom). After filming a video on my iPhone for a project I’m working on, I had to admit that it looked vaguely like a bruise, and the purple on one end was fading on the inner lip, which gave a weird look when I talked. For that reason, I ended up removing the lipstick and just keeping the eyeliner, which was fairly normal. This was the first time during the week that I backed out of a look, so I wanted to make sure that on the fifth day, I did something that was a little bolder again. Day 5 was the look most outside of my comfort zone. I used gold eyeshadow and a white eyeliner pencil to create a line running from the bottom of my lips to my chin and paired it with a red lip and red earrings. 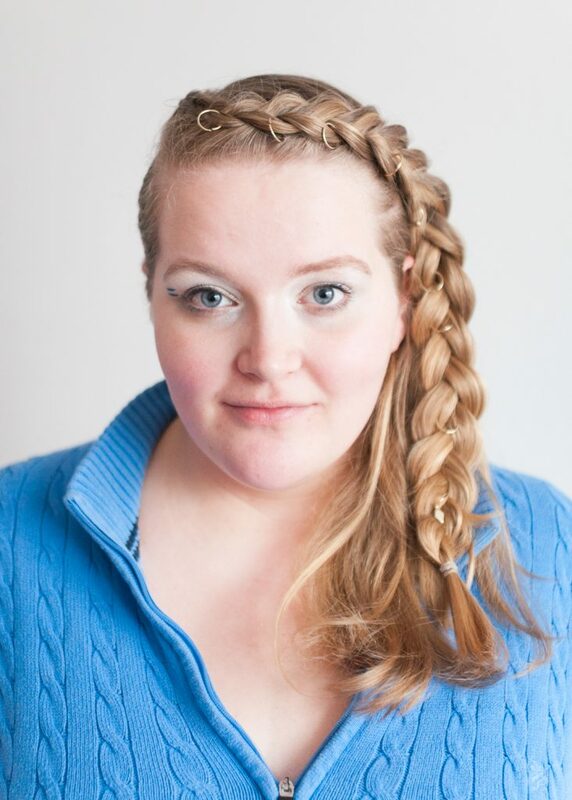 For my hair, I made four little ponytails down the back of my head and braided them into a single braid. This look was pretty out-there, but I really enjoyed trying it out. Similar to the first look, it made me feel confident and bold in a way that I don’t normally. I didn’t have much on the agenda today, but I did get a lot of strange looks for this one. My friends actually liked it, though, and Ken said that it reminded him of Padmé Amidala, which was a high compliment in my eyes. This experiment was really fun for me, for a few reasons. First, it really pushed me out of my style comfort zone. I never wear bold makeup with the exception of costume parties, so even a red lip is kind of bold for me. 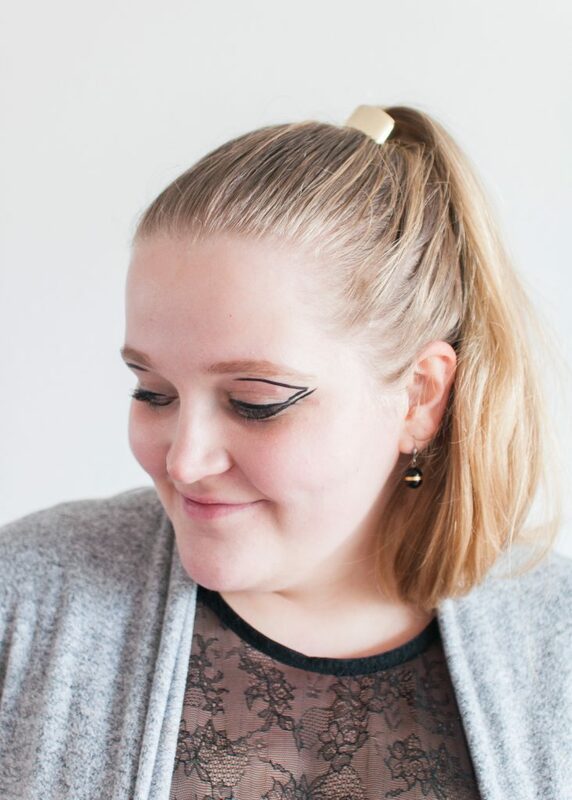 Jumping from very neutral makeup to something really out-there was really fun just for that reason: I got to experience makeup in a way that I don’t normally. But it was also really great because it reminded me of how fun makeup can be. 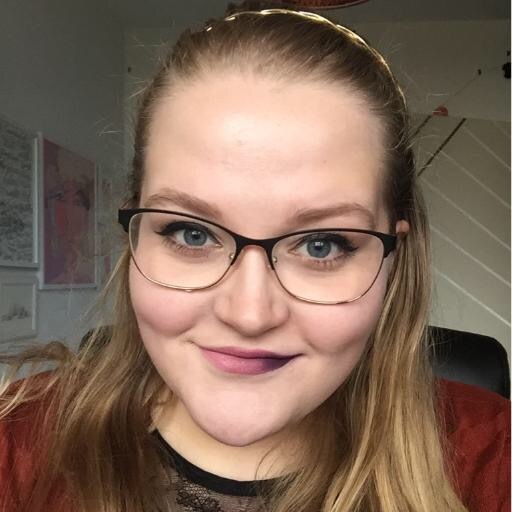 For the last year or so, makeup hasn’t been fun for me — just a normal part of my life, which at some point started to feel less like expression and more like an obligation. But this experiment reminded me that makeup can be creative and unique, and that I can use it as a means of personal expression. Will I wear looks like this on a daily basis? Probably not. But I have to say that I enjoyed it a lot more than I thought I would, and that it served as a bit of a reset button for me. I no longer feel that I have to wear makeup every day, and when I do wear it, I know that I can push outside of the boundaries I normally place on my style. I don’t think that these looks will necessarily be popular for the future. But if creativity and personal expression is the future of makeup, then I’m here for it.